Well look-y here fashionistas! It seems the trend of using role models in fashion campaigns instead of conventional models is fast becoming a trend. Just recently we shared the awesome story of fashion line The Limited using 60 role models from a range of different industries to promote women in leadership. It seems the more we use our voices on social media and other public platforms to talk about how women deserve greater role models and representations of our gender in media, fashion and advertising, the more powerful we become. And that’s the way it SHOULD be dammit! Consumers should be the ones demanding what we want from our favorite brands, because if we are going to invest our hard-earned money in a clothing line, a product, or a service, we want to know that a company cares about the message they send us. 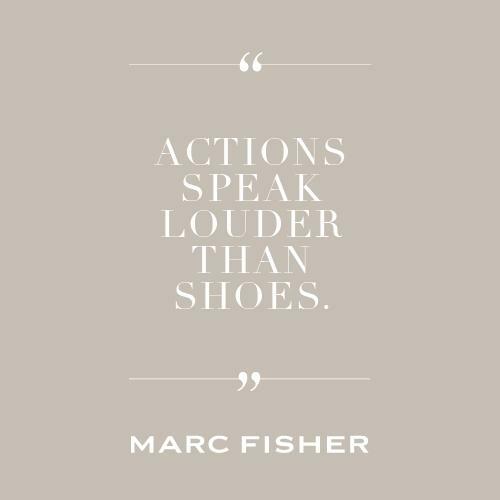 Another brand that is clearly taking note of this power of the people, is Marc Fisher Footwear. The brand has just released an awesome new campaign called ‘Make Your Marc’ designed to encourage women to think about what kind of impact they want to make in the world. And with awesome role models like Malala Yousafzai who are inspiring a whole generation of girls that they can make a difference no matter what age, race, economic background you are, and Sheryl Sandberg who are influencing a generation of men and women to pay attention to gender equality, a campaign dedicated to fostering role models in every day society is something that is as much needed as it is trending. Similar to The Limited’s idea, Marc Fisher have called upon a group of badass influential women in society to really hit a home run with this message. The campaign is also very people-powered, as they are asking consumers to suggest candidates via their website, and they have a whole year to submit names and stories. The brand has also selected a group of their own badass role models they believe are changing the world in a number of different ways. Marc Fisher’s namesake founder says he built this campaign around the idea of legacy. “I started #MAKEYOURMARC to align my passion for shoes with the greater purpose of celebrating and supporting women who make a difference. These women have always inspired the shoes I make and I’m delighted to recognize their incredible achievements and give them financial support to continue their exceptional work,” he said in a statement on his website. Along with the role models being promoted in the campaign, the nominees submitted by users will be selected to receive financial grants throughout the year of the campaign being open in order for these women to continue the important and impactful work they are doing. “MAKEYOURMARC is about celebrating and supporting exceptional women who are making their ‘marc’ in the world. These real life role models are making positive change in education, community, art, human rights, health, technology, philanthropy, volunteerism and more,” says a description of the campaign. Joining this group of women are additional celebrated nominees including Brittany Bergquist (Cell Phones for Soldiers), Jill Harlan (That’s What She Said), Veronika Scott (The Empowerment Plan), and Angela Walker Patton (Girls For A Change). Despite the use of non-conventional models, they are making one very high-profile exception: Victoria’s Secret angel Karlie Kloss. It turns out this amazonian beauty is known for more than just being besties with Taylor Swift and rocking a pair of angel wings on arguably the biggest fashion runway stage. After taking a coding class a while ago in NYC through Code.org, Karlie decided she now wants to encourage other girls to get into tech, an industry known to be sorely lacking in female presence especially in the engineering departments. She started Kode With Karlie, a scholarship fund that will help other girls to attend the same coding class she went to in New York as she is well aware of A) the position she is in to help, and B) why coding is something very important. “I feel fortunate that modeling has given me a platform that I can use to make my ‘marc’. I want to use this platform to ignite the same excitement I have for coding in other young women. That’s why I started Kode With Karlie,” said the supermodel in a statement. Having her efforts promoted as part of the #MakeYourMarc campaign is a prime example of women using their resources to help other women. “As an advocate for the critical role computer science plays in our future, Karlie believes it is crucial for women to learn to code as early as possible to ensure they have a voice and stake in what the world looks like. At present only 12% of computer science degrees go to women…this is something Karlie is working to change,” said the footwear brand about her scholarship. Needless to say, we’re huge fans of this initiative as it is one huge platform (fashion) using its power to promote something we need more of (impactful female role models and leaders). “My advice to people who want to make their mark, is don’t be afraid to try something new and don’t be afraid to try something hard,” says Rebecca Garcia, CoderDojo co-founder, in the video below. “We’re all connected and everything we do impacts one another. It’s about that one person and the life that you change” adds Julia Fehrenbach from Building Blocks for Change. You can find out more details on the Make Your Marc campaign by clicking here. For us, more than anything, we love seeing the ways women are elevated in society, and encouraged to make a difference, no matter what industry or talent they have. We have no doubt the women featured in the video below will inspire you to go out and make the most of what you’ve got. If you have the chance to impact or change the live of even one individual in a positive, empowering way, then you are a role model and the world needs your voice.